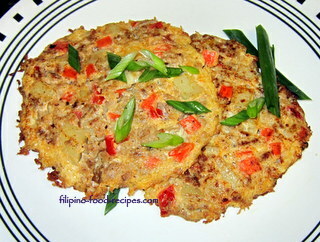 Tortang Giniling is simply ground meat omelet. They can either be in round patty form or folded in half-moon shape. 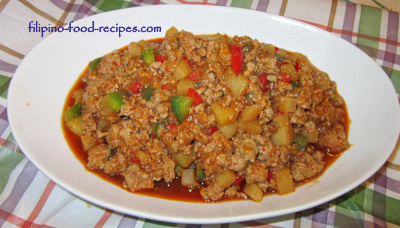 In my household, leftover Giniling Guisado is used. That's because nobody wants to eat leftovers, so my mom would convert it into another dish. 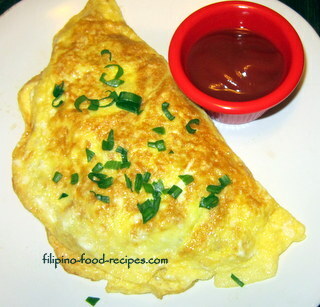 Omelets can come in one single patty with both the filling and eggs cooked together in rounds and cut in triangles. ...or they could be a half-moon shaped scrambled egg with the meat filling enveloped inside. 1 Beat two eggs and season with salt and pepper. 2 Pour onto a heated 10 inch saute pan with about 2 tablespoons oil, spread the egg to make a round flat shape and let cook for about a minute or until the edges are set. 3 Spread about 3 tablespoons meat filling along the half side of the egg and gently fold the unfilled side over to make a half-moon shape. 4 Flip the whole thing to the other side to cook. 5 Repeat procedure for the rest of the eggs. 6 Serve with rice and Banana Ketchup dipping sauce. 1 For every egg, measure 3/4 cup of the giniling. Beat all the eggs together, season with salt and pepper and mix with the Giniling. 2 Measure about half a cup of the mix and pour onto a heated pan with oil. Let cook for 2 - 3 minutes. 4 Repeat with the rest of the egg/meat mixture. 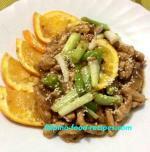 5 Serve with rice and Banana Ketchup dipping sauce. Omelets tend to soak up a lot of the oil that you cook it in so use a non-stick pan and try to limit the oil that you use. It is best to do two eggs at a time for the folded omelet to easily flip the egg on its side without deforming the shape. However, with practice, you could do several eggs and make a giant half-moon omelet perfectly.